This popular brand could soon disappear. The teen retail industry is fiercely competitive. It's an arena in which companies must constantly adapt to changing consumer preferences and difficult-to-predict fashion trends. Even the strongest companies can find it difficult to consistently navigate these treacherous waters, and the weaker retailers often disappear completely. Let's dive into the details of one teen retailer investors should probably avoid. 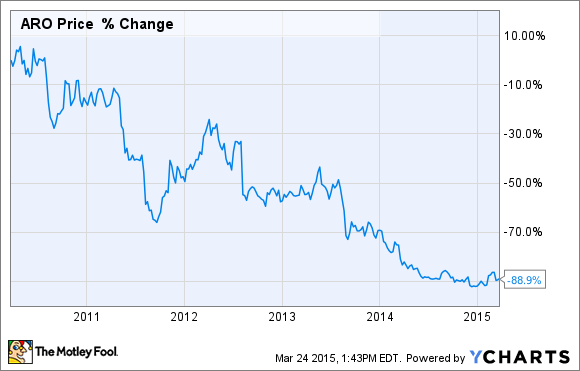 Aeropostale (NASDAQOTH:AROPQ) has been struggling for several years. Last year was particularly brutal for the company, with net sales for fiscal 2014 falling 12% to $1.8 billion as comparable-store sales plummeted 11%. And that's after a 15% decrease in comps in 2013. Aeropostale also suffered a full-year net loss of $206.5 million, or $2.62 per diluted share, as store asset impairment charges, restructuring charges, store closing costs, and employee severance costs all took a toll. Unfortunately, it does not appear the situation will improve anytime soon. Management expects an operating loss in the range of $39 million to $45 million in the first quarter of fiscal 2015 and a net loss in the range of $0.53 to $0.61 per diluted share. That outlook does not include the impact of any store impairments, accelerated store closure costs, or real estate consulting fees. That's significant, because the company closed 77 Aeropostale and 115 P.S. from Aeropostale stores during the fourth quarter, and management is considering closing 50 to 75 more Aeropostale stores in 2015. Aeropostale does not appear to be in immediate danger of a liquidity crisis, as the company ended the year with cash and cash equivalents of $151.8 million and long-term debt of $138.5 million. As of Jan. 31, 2015, Aeropostale also had $116.8 million available under its revolving credit facility. Still, if the company cannot right the ship and shoppers continue to flock to competitors, plunging sales and continued operating losses will eventually take a toll on Aeropostale's balance sheet. Aeropostale's stock price reflects this worrisome trend: shares have plunged by more than 85% in the past five years. Yet even at today's depressed price, without many signs that a turnaround is under way in its core retail business, investors might wish to steer clear of Aeropostale's shares.